Grant by Ron Chernow, reviewed by David Plotz. 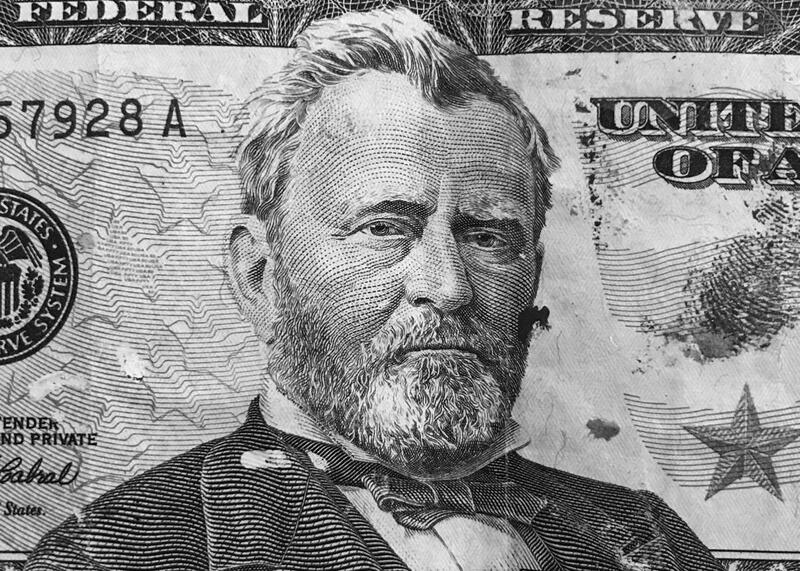 With his new biography of Ulysses S. Grant, Ron Chernow turns the life of yet another misunderstood figure from U.S. currency into narrative gold. No American ever rose further faster than Ulysses S. Grant. Grant washed out of the Army after a promising start—West Point, Mexican-American War heroics—and by 1859, he could be found wandering the streets of St. Louis in ragged clothes, broke, begging for work. When the Civil War broke out in spring 1861, Grant was a notoriously indifferent junior clerk at his father’s leather goods store in Galena, Illinois. By February 1862, Grant had led the Union army to its first important Civil War victories at Fort Henry and Fort Donelson. By the middle of 1863, he had stabbed and gutted the Western Confederacy into irrelevance with sweeping victories in Tennessee and Mississippi. By 1864, he commanded all the armies of the United States. By April 1865, he had crushed the Confederate Army, sacked the Confederate capital, and accepted Robert E. Lee’s surrender. And by November 1868, he had been elected president of the United States without ever campaigning for or seeking the job. At the time of his death in 1885, had you asked anyone to name the greatest Americans of the 19th century, Grant would have been second on every list, right behind Abraham Lincoln in the North and Lee in the South. Grant was revered in the North for his battlefield brilliance and moral courage and admired in the South for his magnanimous treatment of defeated Confederate soldiers. But for reasons that are grimly relevant to this dark moment in American political life, Grant toppled from his pedestal. From his Gilded Age peak, Grant plunged and plunged, past mere mediocrity to ignominy. He became the drunken butcher, an uncouth rube who won the war only because he extravagantly sacrificed his soldiers, a doltish political patsy who presided over the most corrupt presidency in American history. Grant was slandered in service to the Lost Cause, the false narrative that Southerners adopted a century ago to explain away defeat and blot out the shame of slavery. One key element of the Lost Cause was to tar Grant in order to elevate the “honorable” Southern generals he crushed in battle. Now comes Ron Chernow, who has been slogging his biographical way through American currency, one misunderstood white guy at a time, to vindicate the man on the $50 bill. In Grant, Chernow has a harder task than he had with his $10 Founding Father. Most Americans had no opinion of Alexander Hamilton before Hamilton, but Chernow must overcome a century of dishonest prejudice against Grant. Chernow confronts the almost insurmountable problem that any Grant biographer must overcome, which is that the best book about Grant that could be written has already been written, by Grant himself. Chernow cannily faces that on Page 1: He opens Grant with Ulysses, dying in agony from throat cancer, scribbling out the final pages of his memoir, finishing it three days before his death. Thanks to Mark Twain’s support and Grant’s brilliance as a writer, the memoir became one of the best-selling books in American history and saved Grant’s widow Julia from poverty. It is also a literary masterpiece—simple, honest, modest, and funny. Chernow recognizes he can’t outwrite Grant. Instead, the goal of Grant is to restore Grant’s reputation to where it was 130 years ago. To that end, the 959-page biography is like Grant’s own Civil War campaigns: a massive accumulation of resources, deployed in an inexorable fashion to overwhelm an immoral opposition. Chernow’s book is a relentless artillery barrage of primary sources aimed at proving his several theses: Grant was the titanic genius of the Civil War, the greatest champion of Reconstruction, an underestimated president, one of the finest writers America ever produced, and a humble, charming, and decent man. Chernow’s book is comprehensive. Readers will learn an amazing amount about obscure episodes in 19th-century political history. (Who knew that the Dominican Republic came this close to statehood?) But his primary purpose is to reject the four falsehoods that came to define Grant. Was Grant a savage butcher who won the Civil War merely by strength of numbers? Chernow amasses enormous and persuasive evidence that Grant despised bloodshed and cruelty, and fought the war as he did in order to minimize death and destruction. Six Union commanders before Grant failed to develop a winning strategy. The Confederacy may have won occasional battles against Grant, but Grant won every campaign (and almost every battle, to be honest) because he was a much greater strategic thinker than Lee or his fellow Rebel generals. Chernow even makes the case that the battle most associated with Grant’s murderous reputation, Cold Harbor, was a key part of a larger, strategically essential, and victorious campaign. Chernow shows how Grant, who had spent his early Army career as a supply officer, invented modern warfare by mastering logistics. He used railroads, the instant communication of telegraphy, the rapid movement of armies, siege tactics, amphibious operations, and trench warfare to systematically destroy the Confederacy’s ability to wage war. Grant essentially wrote the book on how war would be fought for the next half-century. Was Grant an incompetent president? In Chernow’s telling, Grant believed in a weak executive, and governed accordingly, deferring to a strong Congress and his own decent Cabinet. Still he made a mark, especially in civil rights. Grant battled to preserve Reconstruction, appointed the first black federal officials, sent troops to protect black citizens and officeholders, and most successfully of all, crushed the Ku Klux Klan’s first wave of terror and vanquished the KKK for a generation. Reconstruction failed on Grant’s watch not because he botched it but because Southern revanchist resistance and Northern weariness overpowered it. Grant crafted a more tolerant, less genocidal policy toward Native American tribes. And he midwifed the most important alliance in American history. Great Britain and the United States were at odds after the Civil War because of British support for the Confederacy, but Grant’s diplomats crafted a treaty that restored peace, ended territorial disputes, and built the foundation of the enduring Anglo-American-Canadian alliance. Was Grant corrupt? He was naïve and gullible in business in a way he was not in war. He surrounded himself with con artists and rich people, and both took advantage of him. Before the Civil War, he was repeatedly bilked by shady friends and business partners (He invested in an ice ship—the ice melted. A chicken farm—the chickens died). While president, much of his Cabinet and many of his top aides ripped off the nation with whiskey scams, Indian trading post scams, other Indian trading post scams, and railroad scams. Grant never made a penny from the graft all around him and seemingly never realized it was even happening. After his presidency, he was suckered once more, partnering with a Ponzi schemer who left Grant ruined. In 1881, the beloved general who saved the Union, the two-term president, found himself with a net worth of $80. Grant was a drunk. PolitiFact rating: mostly true. Chernow spends an enormous percentage of his 1,000 pages defending Grant against the claim that he was a dangerous souse. The very last paragraph of the book concerns it. Chernow analyzes literally every one of Grant’s reported benders, stitching together far-flung sources and making Sherlockian inferences about them in order to argue the case that, yes, Grant was an alcoholic, but he was a solitary drinker who rarely imbibed when working, and never when it mattered. For being a million pages long, this book is brisk and clear, and if it doesn’t spawn a Tony-winning musical—country and soul would be fitting this time, not hip-hop—it won’t be Chernow’s or Grant’s fault. I would happily hum along to “There’s Food in Your Beard Again, Ulys,” and the Lincoln solo, “I Can’t Spare This Man. He Fights.” Chernow’s Grant is as relevant a modern figure as his Hamilton. His Grant is a reminder that the very best American leaders can be, and should be, self-made, hard-working, modest for themselves and ambitious for their nation, future-looking, tolerant, and with a heart for the poor and the least. Grant by Ron Chernow. Penguin Press.